I know - the title makes you wonder - but I’m so excited to tell you about these cupcakes! They turned out so perfectly (if I do say so myself) and were such a hit! I can’t tell you how fulfilling it is to ghave an idea that comes together, start to finish, and makes other people happy!! Ah! They're just so pretty...I love them! Anybody recognize those liners? I got them from Pick Your Plum and love them!! Check out the link on my side bar under "affiliates" for more of their awesome goodies! Preheat oven to 350 degrees and prepare cupcake pans. Mix all ingredients in mixer until just combined. Fill cupcake liners about 2/3 full with batter and bake until springy to touch or tester inserted in middle comes out clean. Let cool. Cream butter, shortening, and cream cheese until light and fluffy. Add vanilla, lemon juice and peel and mix until combined. Add sugar, one cup at a time, mixing well after each addition. If you need more than 4 cups for consistency, add extra a little at a time until you get it where you want it. Add enough food coloring to reach desired color and keep icing cool until ready to use. 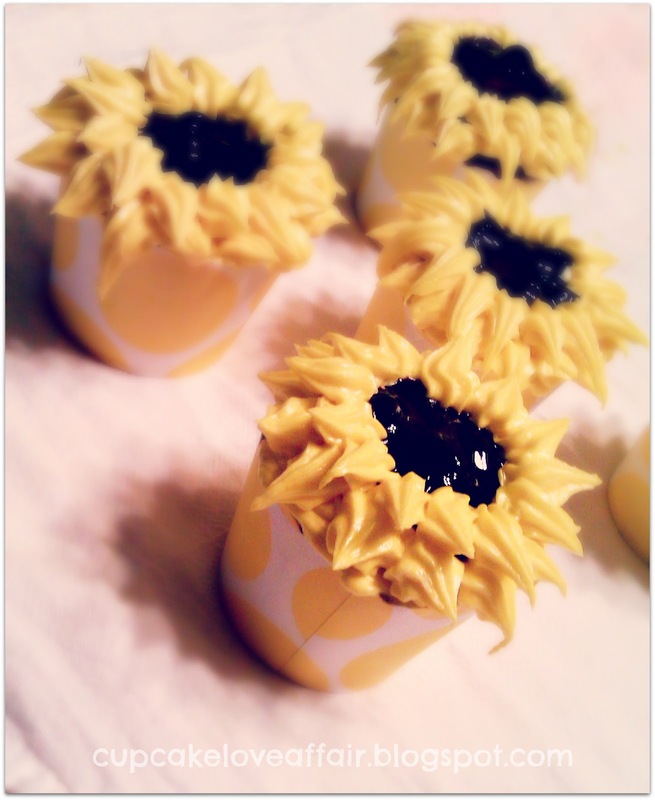 You'll be happy to know that I actually took pictures of the flower making process! Now you can see what I'm talking about as I explain the procedure....yay me! 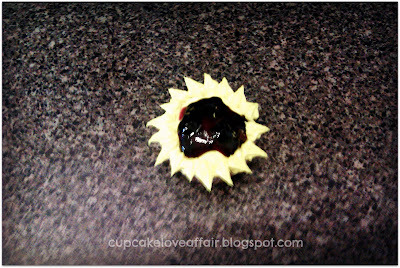 Lightly frost cupcake with a small amount of icing and drop about a teaspoonful of blackberry jam in the center. It's ok if the jam runs because you're going to cover this up with the petals. Last, but certainly not least, move in on the cupcake and pipe a second row of petals, making sure to completely cover the edge of the jam so that you have a round center. Try to place this second row in between the petals of the first row. Voila! 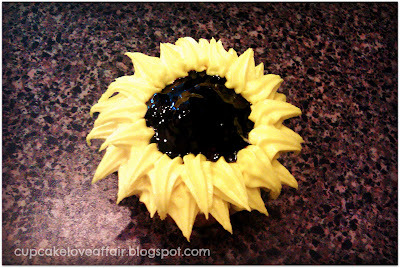 A beautiful sunflower cupcake!! 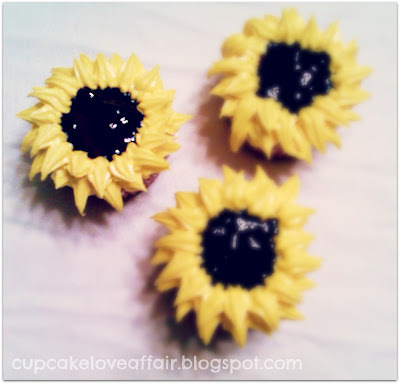 Even if you don't make the sunflowers (although I don't know why you wouldn't...they're so perfect for summer) please try this recipe! It's so delicious and refreshing this time of year. My dad said that these are his favorite so far and, even though I started with a box mix, I still feel accomplished because I doctored it up so much. Also, two things you may have noticed. First, A Cupcake Love Affair is now accepting sponsorships through Passionfruit Ads. If you're looking for a place to advertise your blog or shop, stop by my Sponsor page and check out all the options! Second, you may have noticed that my followers count is steadily heading toward the big 200 (well, for me, that's big)! Between GFC and Bloglovin', almost 200 readers are following along with us and I have to tell you that that's really exciting for me! I never thought that many people would be interested and, yet, you all just keep on showing up and coming back for more. Thank you! I've decided to do another giveaway when I reach 200 so spread the word. What will I be giving away? Let me just say this...I won't be the only one giving something away and the number of "bloggy" friends who have volunteered to participate...well, you don't want to miss this!! If you're a fellow blogger and would like to participate in the giveaway, shoot me an email on my contact page. I hope you're all having a fantastic summer! Until next time, happy reading and more importantly, happy cupcake-ing! These look great! I really like the liners! Your sunflowers are really cute! I have made something similar with mini Oreos for the center of the flower. Love those liners too! They look too good to eat. I love how you decorated the cupcakes. The blueberries look fantastic in the center. So pretty! And they look delicious! Thanks for sharing at the Pomp Party! Pinning to our Pomp Party board! 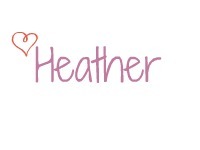 What a darling blog!!! I am so excited to be your newest follower! You should stop by my blog and post one of your awesome recipes today on the blog recipe hop so everyone can see!! These are amazing and definitely for an amazing lady! Ugh! Where were you yesterday when I needed you?? I could've made these last night for my motherinlaws birthday today! 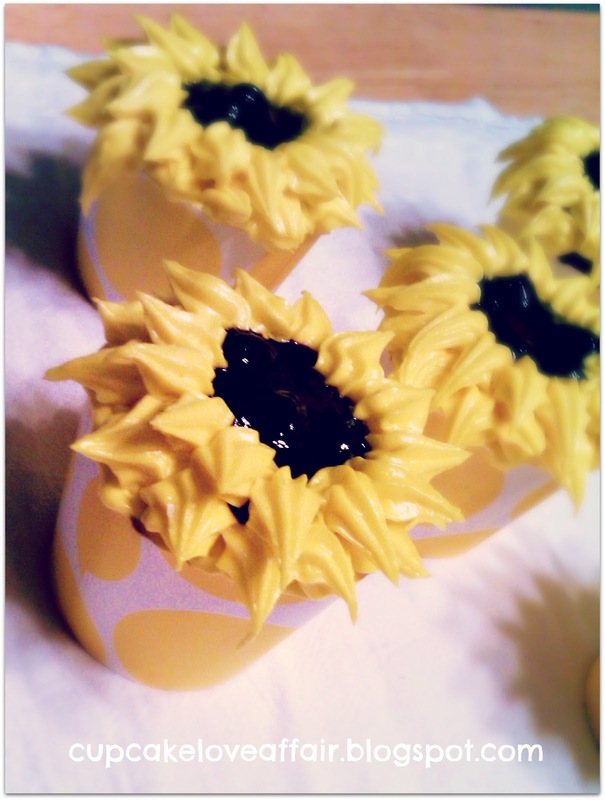 She looooves sunflowers! And I am a Florida blogger too!!! And now I'm hungry! 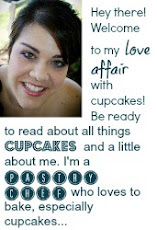 I loooooove cupcakes and the fact that I get to see your work and get the "secret recipe" its phenomenal!! These are adorable! So detailed!! Nice touch. 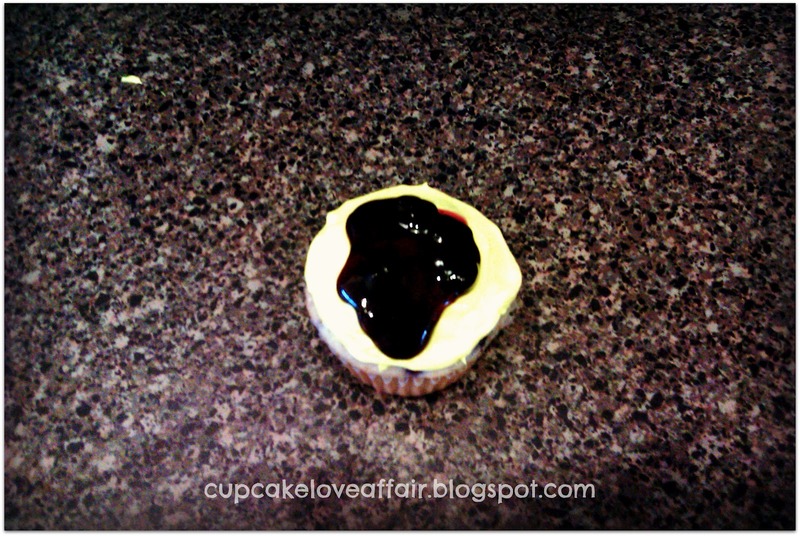 Thanks for linking to Foodtastic Friday! These are BEAUTIFUL!!! I am a FL Blogger too! Let's be friends! :) New follower. From Book, to Movie, to Dessert! First Swap = One Happy Girl!